This year it was not the mighty ancient king Mahabali who visited his subjects during the festive days of Onam, but an unfortunate deluge embraced Kerala. Tens of thousands were directly affected when incessant downpour forced the State Government to open floodgates of 33 brimful dams resulting in the overflow of all major rivers, causing severe flood. Particular areas experienced landslides which crumbled houses and hopes of people in the twinkling of an eye. The weather department issued red alerts in all 14 districts of the State which were paralysed by floods leading to loss of life and resources, damaging homes, schools, hospitals, shops, etc. As the whole State is recovering from the terrible shock, the blame game has already begun. Some point a finger at the State Government for its poor dam management, many others accuse the Central Government of not supporting the State adequately. The moot question is: Did we miss to find out the root cause of these calamities? Kerala had been warned several times by various Indian ecologists, academicians, thinkers and writers that it should take care of the Western Ghats, a mountain range which stretches through nine districts of Kerala and is one of the eight hottest hotspots of biological diversity in the world. But the warnings were ignored. The systematic destruction of the Western Ghats has serious consequences, threatening to drown Kerala. The destruction of the Western Ghats has a history, which began way back from pre-Independence period. JD Munro, a colonial spin-off and lawyer employed under then Travancore Government in 1877, bought nearly 600 kilometres of land in the Western Ghats and started tea plantation. Till then, the Western Ghats were a dense jungle, an undisturbed abode for wild elephants and tigers. Tea plantation became a major activity transforming the entire landscape of the forest into manicured tea gardens. Further in 1907, Harrisons & Crosfield, which was set up as Tea Traders in Liverpool, bought and established Malayalam Plantations Limited. With the birth of plantation in the areas in the 19th century, what was once a dense forest with many endemic flora and fauna became an open tourist destination. In fact, the deforestation of the Ghats by the British had started considerably earlier. In view of the growing deficiency of oak in England, they depended on a permanent supply of teak timber from Malabar, writes EP Stebbing in his book The Forests of India, London 1922. Colonial offspring, not committed to this land or its resources, are destroying nature and it is obvious that colonialism has only looted and destroyed the lands under its rule. But did we think that the destruction of the Western Ghats stopped, if not abruptly, post-Independence? Really! Post Independence, we took the baton from colonialists and resumed with double their speed the work to destroy Western Ghats to the core. Most of the biodiverse forest areas were destroyed for building big concrete structures for resorts and hotels and for growing crops, such as coffee, cinchona, sisal, cardamom, and, of course, tea. Now for more than half a century, Harrisons Malayalam has grown through the acquisition of smaller companies and individual estates, and is crowned as one of the largest establishments in the Western Ghats. The company has ten tea estates with a plantation area of about 6,000 hectare and 12 tea factories. Kannan Devan Hills Plantations Company Private Limited, which is another pioneer in tea plantation, has a total area of 23,783 hectare, all located in the high ranges of the Western Ghats. To our utmost surprise, Kerala now leads the nation in floor area per capita but as per the Ministry of Statistics & Programme Implementation of the Government of India, Kerala stands at the 16th position in per capita Income. Average floor area occupied per person is a matter of concern when a major portion of the nine districts are ecologically sensitive. Consumerism, which has its roots in the British industrial revolution of the 18th century, has intruded the indigenous culture of Kerala and has now resulted in people spending more on building big palatial houses, imposing hotels and resorts. The mass construction of big houses without considering the ecological sensitivity of the area concerned is ominous. From an ancient culture which considered both man and nature as the manifestation of the Supreme and thus advocated living in harmony, we are slowly moving towards a life of consumerist pleasure which has no space to care for our planet or its inhabitants. The Syro-Malabar Catholic Church, the State’s largest church which accounts for the maximum number of people inhabiting the Western Ghats, strongly opposed the Gadgil report. The State even witnessed a massive protest by the Church against the report. Kerala’s then Government and the Opposition gave a cold shoulder to the Gadgil report, maybe another story of vote bank politics. And Kerala decided to bypass the suggestions of Gadgil and decided to declare all human settlements in the Western Ghats outside ecosensitive zone, as legal. Foreseeing the annual climatic events, we should have a flood area mapping and proper strict regulations for constructions in and around the flood expected areas. Places like Kuttanad in Alleppey district have the lowest altitude in our country and flood due to rain is not an uncommon affair. However, the place still follows the same old construction models. Netherlands is a country which faces the same issue of flood control as about two-thirds of its area is vulnerable to flooding. Learning from previous experiences of havocs created by floods, the country has “Water Control Boards” which are local government bodies who maintain the complex system of managing the ditches, dams, reservoirs, canals and pumping stations. With their foresight and technological developments, they are able to keep a check on the dangerous threat posed by floods. Taking the cue from them, Kerala too should have construction policies especially in lowlands and other stringent measures adapted to meet the catastrophe. If the Kerala Government truly wished to lessen the effect of floods, dam reservoirs should have been relatively emptied. Kerala has two rainy seasons: the Southwest monsoon and the Northeast monsoon. This means that even if Kerala loses some amount of water during Southwest Monsoon, the State could compensate with the rainwater from Northeast Monsoon. 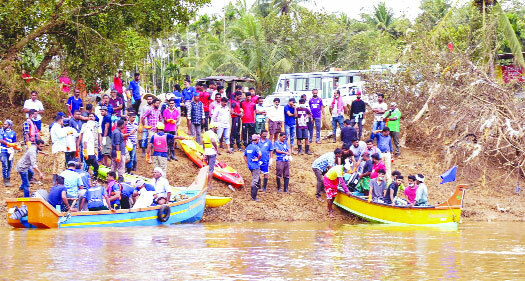 CPI(M) MLA Raju Abraham said even before any warning, Ranni in Pathnamthitta had started flooding, adding there were lapses in the opening of shutters of various dams. Even Wayanad CPM district secretary P Gagarin said there were complaints that people were not informed properly beforehand. No one can foil nature’s fury, but a timely and concerted efforts can attenuate the effects. The weekend home in the Western Ghats are more lavish and energy-consuming than a city home; this is not luxury, it is actually extravaganza which should be curtailed. The difference between colonial exploitation of the Western Ghats and the exploitation post-Independence can be simply put as: the former were candid enough and straightforward in its destruction, while the latter cited “development” as a reason to justify the destruction of nature. With a large and growing population, there is unquestionable need for space, resources and money. But should we stop caring for the balance between consumerism and eco-sustenance? When an expert like Gadgil, after thorough studies, calls “Kerala floods 2018” a man-made disaster, shouldn’t we launch a probe into the floods? We are left with two options now: Either go to the root causes, fix it properly, make necessary precautions based on comparative studies and technology; or hail the post flood rhetorics!